NASHVILLE, TN--(Marketwired - September 26, 2016) - The American Society of Composers, Authors and Publishers (ASCAP) honored the songwriters and publishers of Christian music's most performed songs of the past year at the 38th annual ASCAP Christian Music Awards on Monday, September 26th. The gala, held at Rocketown in downtown Nashville, was hosted by multi-platinum, three-time Grammy-winning contemporary Christian music star Michael W. Smith alongside ASCAP's President and Chairman Paul Williams and Vice President of Nashville Membership Michael Martin, before an audience of distinguished songwriters, Christian music stars and music industry leaders. The ASCAP Golden Note Award was presented to Mark Lowry, in recognition of his extraordinary career and lasting impact on modern worship music. A total of 30 most-performed song awards were presented by Martin along with Senior Creative Director Mike Sistad, Director of Strategic Services Kele Currier and Creative Manager Beth Brinker. Renowned recording artist Phil Keaggy opened the show with his new single, "Not Be Moved," from his recent album, All At Once. Ben Glover earned ASCAP Christian Music Songwriter of the Year honors for the fifth time in his career, and also picked up awards for writing eight of 2015's most-performed songs, including Song of the Year, "Flawless," recorded by MercyMe and co-written by David Garcia; "Shoulders," recorded by For King & Country; "Jesus Loves Me," recorded by Chris Tomlin; "Come As You Are" recorded by Crowder; "That Was Then, This Is Now," recorded by Josh Wilson; "More of You" and "Through All Of It" recorded by Colton Dixon; and "Save My Life" recorded by Sidewalk Prophets. Matthew West earned his third ASCAP Christian Music Songwriter-Artist of the Year award, having previously claimed the title in 2013 and 2015. He also earned three ASCAP most-performed song awards for his own chart-topping singles, "Grace Wins" and "Day One," as well as "Just Be Held," recorded by Casting Crowns. In 2014, West was named ASCAP's top Christian Music Songwriter of the Year and also earned the ASCAP Christian Music Song of the Year award for his single, "Hello My Name Is." ASCAP Chief Executive Officer Elizabeth Matthews presented the ASCAP Christian Music Publisher of the Year Award to Capitol CMG Publishing, which claimed the title for the 14th consecutive year with an impressive 16 award-winning titles. Capitol CMG Executive Vice President Casey McGinty and his team were on hand to accept the award. As previously announced, the prestigious ASCAP Golden Note Award was presented to comedian, songwriter, artist and author Mark Lowry, who was honored with remarks by Michael W. Smith as well as the RIAA's best-selling female comedian Chonda Pierce. The Brentwood Baptist Choir wowed the audience with a 122-member performance of Lowry's most well known song, "Mary Did You Know." ASCAP surprised singer, songwriter, actress, author and radio host Jaci Velasquez with the ASCAP Creative Voice Award after a performance of her brand new song, "Trust You." The awards is given to ASCAP members whose significant career achievements are informed equally by their creative spirit and by their contributions to the role that a creator can play in the community. Notable songwriters and artists in attendance included MercyMe, Unspoken, and Francesca Battistelli, who performed her hit single "Holy Spirit," as well as ASCAP Board Members Desmond Child, Barry Coburn, Dan Foliart and Wayland Holyfield, and more. The American Society of Composers, Authors and Publishers (ASCAP) is a professional membership organization of songwriters, composers and music publishers of every kind of music. ASCAP's mission is to license and promote the music of its members and foreign affiliates, obtain fair compensation for the public performance of their works and to distribute the royalties that it collects based upon those performances. ASCAP members write the world's best-loved music and ASCAP has pioneered the efficient licensing of that music to hundreds of thousands of enterprises who use it to add value to their business -- from bars, restaurants and retail, to radio, TV and cable, to Internet, mobile services and more. The ASCAP license offers an efficient solution for businesses to legally perform ASCAP music while respecting the right of songwriters and composers to be paid fairly. With over 585,000 members representing more than 10 million copyrighted works, ASCAP is the worldwide leader in performance royalties, service and advocacy for songwriters and composers, and the only American performing rights organization (PRO) owned and governed by its writer and publisher members. Learn more and stay in touch at www.ascap.com, on Twitter @ASCAP and on Facebook. 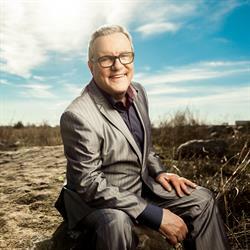 Comedian, songwriter, artist and author Mark Lowry received the Golden Note Award at the 38th Annual ASCAP Christian Music Awards.